Lamination technology is used for various industries such as semiconductor packing, office automation equipment and decorative parts etc. 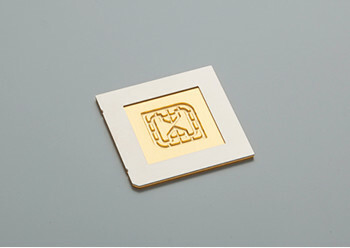 High-adhesive process is needed in various fields such as electronic industry now. We are able to advise from the adhesive material type to process for the customers based on our wide experiences. We will support from FAI to mass production to meet customers requirement. Heat sink attachment on power leadframes is now required to increase heat dissipation, and adhesive is needed on heat sink. We can advise adhesive tape properties and thickness, and supply it as laminating parts. In case of using thermosetting adhesive tape, we process it under a nitrogen atmosphere and supply it as laminating parts having reflow resistance. 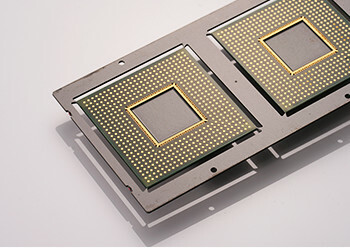 Exothermic issue is occurred by increasing pins of leadframe for semiconductor PKG. It is necessary to attach a heat sink on circuit board to avoid this issue, and adhesive tape with high heat resistance is required. 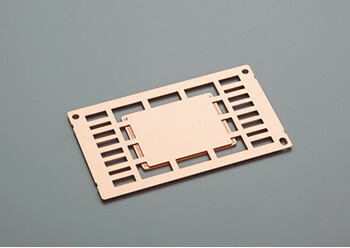 We perform from punching process for making adhesive tape shape to lamination process to attach heat sink or circuit board. We have cold storage system ( below 5 ℃）for the adhesive tape needing cold storage. QFN backside tape is necessary for QFN molding process. Our company can provide tape lamination using various tapes with different makers such as adhesive, thermoset, and thermoplastic tapes. We can accept tape lamination not only our etching leadframe but also customer’s supplied leadframe. Laminate heat spreader onto various types of substrates. 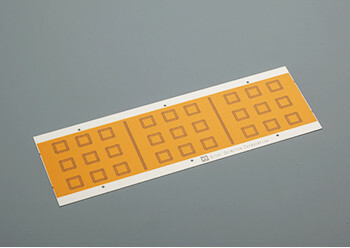 Laminate the thermal curing adhesive tape by heat press or heat lamination. All tapes of normal temperature types, thermal curing types and thermoplastic types are available. Select and suggest the type of tapes, laminations and adhesive according customer requirement. Refrigeration storage and cold storage of tape and adhesive are available. Total service from tape & film, cutting to lamination. Various materials, e.g. molded parts, ceramics, film and glass, are available. Not only prototype but also mass production.